14/05/18: This is a PREMIUM advertisement. Download the full vehicle specification as a pdf file here. MOT failure. 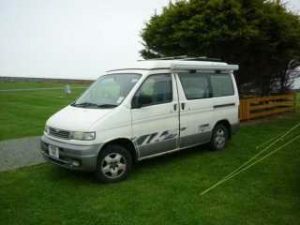 1995 2 wheel drive diesel Mazda Bongo Friendee. Unconverted 8 seater, rear flip-up seats. 132,000 miles. MOT until 19 June 2015, recently retested but failed on rust problems arches & sills. Imported June 2007, only 2 UK owners. Full UK service history & original auction certificate. Roof rack system included. A fantastic drive, nothing at all wrong mechanically, has had full electrical upgrade earlier this year. Coolant system recently inspected. More details and photos below.